By: Dianne Rochelle Ophelia Esq. 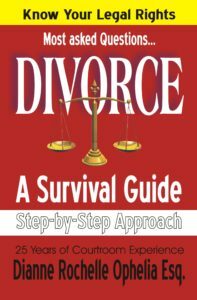 It doesn’t matter why you are getting a divorce, but it does matter how you go about it. Uncontrolled emotions and misguided information can adversely affect your future and the future of your children. This unique, no-nonsense approach is designed to give the reader the tools necessary to take a potentially out-of-control situation and find manageable solutions. Find out why so many have found each chapter to be filled with the steps necessary to achieve this outcome.